Electric Eden is a new compilation album which features songs chosen by author and journalist Rob Young. 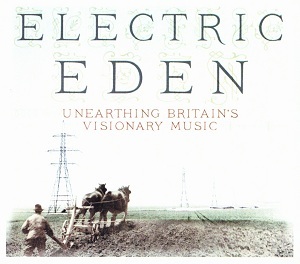 The two disc set is designed to serve as a companion to Young’s highly acclaimed book Electric Eden: Unearthing Britain’s Visionary Music which was published by Faber & Faber in 2010. It's been split into two parts - the first disc is entitled "Acoustic eden" and as you'd expect is more traditional acoustic folk music. The second disc is "Electric Albion" and the music is as you'd expect more driven by electric guitars and modern instruments. This splitting of the material works well. There's a huge range of artists featured here including Nick Drake, David Bowie, Fiarport Convention, Steeleye Span, Traffic, John Martyn, Archie Fisher, Meic Stevens, Bill Fay, Comus, Mick Softley, and many more. Musically the album is also very diverse - Rob Young has picked a great selection of songs that all have a good reason for inclusion. The booklet with the CD is excellent giving plenty of information about the songs selected as well as pictures of the various album sleeves. This is an excellent compilation for fans of folk music which combines a great selection of music with a written historical narrative showing the evolution of falk music. "Electric Eden" is out now via Universal music.